Upstairs at Elizabeth Dee, in a show curated by Larry Ossei-Mensah, I sat with two striking Kenny Rivero paintings, the artist himself, and his lovely mother at the opening of the exhibition. It was my first time seeing Rivero's work in person and meeting the artist — both such a pleasure. Illuminating a vitrine nearby were the smooth reflective graphite marks of the equally captivating drawings Rivero makes on salvaged book paper. I was eager to set a date to draw together as soon as Kenny had finished moving into his new Bronx Studio. Tangled up in transversal spaces, Rivero's obscured objects and figures suggest notions of memory or powerful visions between sleep and wakefulness. In one painting he juxtaposes small details, rendered with the precision of his drawings, next to massive brick walls, translucent structures, and the bottom half of a baseball player with the number 11 on his jersey. The bright white of a baseball stands out nestled in a mitt of gooey black paint. Through Rivero's exquisite mark making the viewer is able to put together pieces from his history and life as a Dominican American growing up in Washington Heights. 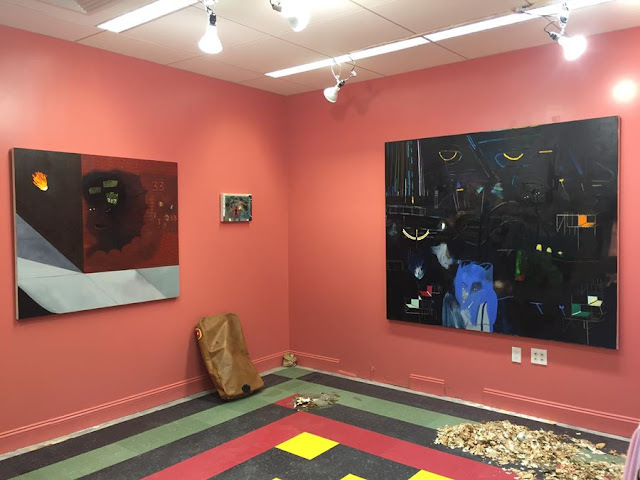 Kenny often alters the space in which he shows his paintings, as he did for his Spring Break Art Fair project curated by Karin Bravin. Adding colored floor tiles, sweep piles and other debris to sections of the room, he allowed the narratives of his canvases to spill out into the space. Some smaller paintings focus on a single figure in portrait format, but push the boundaries of conventional portraiture. In one, a woman's arms melt into the pink of the background and her face is covered with shades of blue. 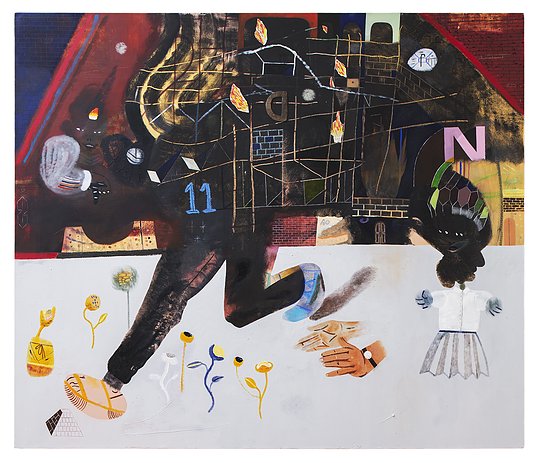 Another canvas depicts a young man's head shooting out beams of red, yellow and white, while the color of his skin becomes one with that of the canvas. Kenny shares his studio, and the floor, with several other artists from his graduate program at Yale. We talked extensively about studio spaces and where they can still be found. He also talked about his experiences at residencies in Miami and New Mexico and his upcoming stint at Skowhegan this summer. 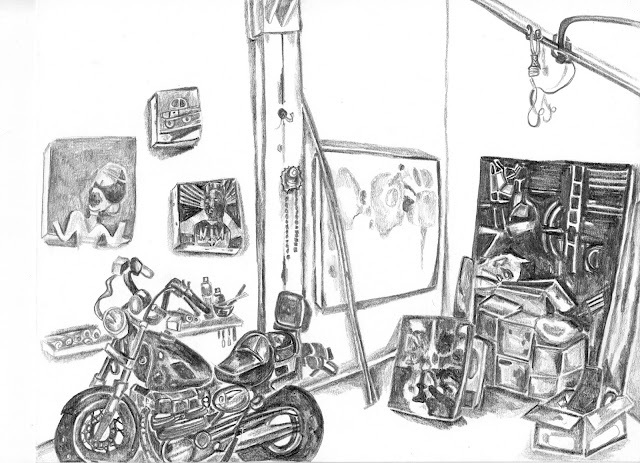 I was happy to be able to meet the challenge of drawing the motorcycle that he picked up at one of his residences and now sits in the middle of his studio. Rivero has a show opening this week at EFA Robert Blackburn Printmaking Workshop featuring oil monotypes and a new lithograph edition. The show runs through June 11th. To see more of his work go here: http://www.kennyrivero.com/.